Nice range of colors, and 2-plying. Your grist is pretty even, too. Well done. Beautiful! Can't wait to see what you do with it! T. Wow!!!! You need to leave a few imperfections so you can prove those yarns aren't mill spun. I'm so glad I'm not entering skeins in any place that your are - those are extraordinary! I haven't spun cotton yet! How is it to spin for a newer spinner? I really like the colors!! Yum Yum I love the colors no, no I will not spin cotton. Bought some once long ago and never did catch on. Maybe it's too cool over here. Thank you, all. I love these colors, especially the purples. Sharon, I have a friend who spins so perfectly that folks sometimes think she's pulling their leg when she tell them her lace knitwear is made from her handspun. The pink especially difficult to spin; I carded it more but it was still pretty neppy. Jewel, I'd say that cotton is not a good fiber for most beginners. The staple is very short and it tends to be slippery and not want to hold together. 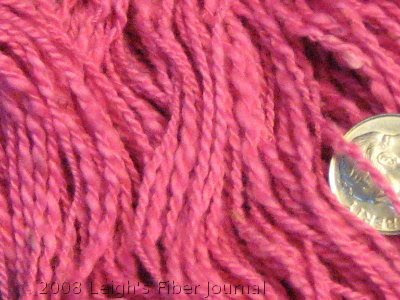 If you can manage to spin it fine with a lot of twist, it makes a lovely, soft yarn. Woolly Bits, I like the idea of a tee! Lovely colours and inspiration - I'm just getting around to organising my first order of Procion MX dyes. Thinking of tips for beginners, did you teach yourself Leigh or learn from a tutor / workshop? Personally, I didn't really understand cotton spinning techniques 'til I got along to a workshop. I guess a good video (if there is one) would also be helpful. Dorothy, I learned how to spin from from videos. The one that helped me with cotton was Patsy Zawistoski's Spinning Cotton, Silk & Flax. Also(! 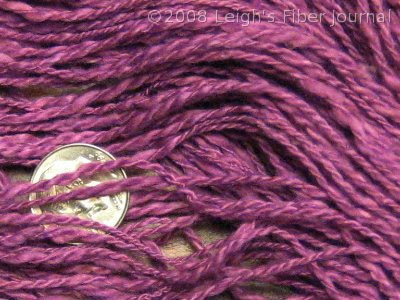 ), for Online Guild members, there are the Cotton Fibre Challenge lessons at our UKWSDOnline2005 Yahoo site under Files > Past Workshops > 2006 > 06-01 Cotton. Leigh you've out done yourself with this project. The color and spinning are wonderful!!!! I have to admit, the one at the top is my favorite so far. I love a deep dark purple. 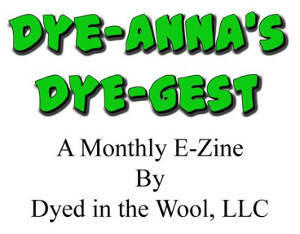 Are you doing all of this dyeing in your kitchen? I always had to do a thorough wipe down of my kitchen after dyeing wool to get all of the loose dye that would float around. Patrick, I did all my dyeing on my little balcony. My kitchen is so tiny that I wasn't keen on possibly getting dye powders, nor drops of dye stock on things. 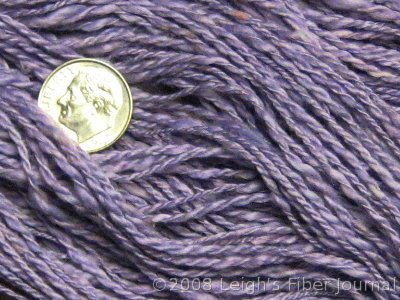 I've pretty much decided that I'll do my dyeing in the summer, and the spinning and weaving of it in the cold months. Thank you Alison, and congratulations on your first loom! If you love yarns and color, then you will love weaving.